Bodyweight exercises like dips and pull-ups are great for really developing the chest, triceps and back. Using just your bodyweight though, your muscles eventually adapt, making the exercise less challenging and minimizing your gains. To counter this, someone invented the dip belt, which allows you to attach weights to your body so the exercise is more challenging. Since the first dip belt arrived on the scene, things haven't really changed much-until now. The EZ-DipT Belt-billed as the "ultimate dipping belt"-was developed by the same crew that brought us the Haulin' Hooks patented lifting straps. And like the Haulin' Hooks, the Dip Belt is equally innovative. 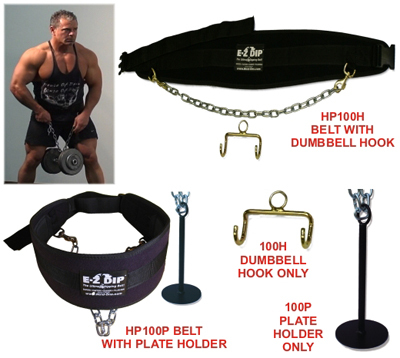 It features a patented never drop "E-Z load" dumbbell hook or an optional plate holder. It's also got dual "E-Z Adjust" chain snap hooks for optimal, no swing load positioning, a multi-user waist buckle snug with a tug of the strap for zero belt slip under load and strategically placed 6mm neoprene hip cushions eliminate bruising regardless of load weight. And last but not least-it's rated for a load of up to 450 pounds. Your typical dip belt is a wide leather or synthetic belt with a metal ring at both ends. A chain is connected to one of the rings, with a clip at the other end so that it can connect to the other ring. The idea is that you slip the belt around your waist and run the length of chain through a plate, connecting the clip-on end of the chain to the other ring. The weight swings free between your legs enabling you to do weighted dips and pull-ups. The whole process is just as simple even if you want to use the optional holder to use plates instead of a dumbbell. The folks at Hypertrophy Enterprises took these issues into consideration when they developed their belt. I tried it out myself and was really impressed. I like the way it feels and I especially like the fact that it's easy and simple to use. Even my buddy who is only 5′ 4″ tall-and he's never been able to use a dip belt because they don't adapt to his small frame-was able to use the EZ-DipT without a problem. It's really very simple to use-you just slip the belt around your waist and pull the strap to quickly adjust it to your size so it fits nice and snug. Next, you clip the free end of the chain to the metal ring-easily adjusting the length of the chain if necessary-and then drop a dumbbell into the holder. It's very easy to do without assistance and even with the dumbbell in the holder, it's easy to walk and get into the proper position. And since you can adjust the amount of swing by using more or less chain, you reduce the likelihood of injury by a wide margin. After using the belt several times, I decided that the EZ-DipT should be a "must-have" if you're in the market for a dip belt. It is far superior to most ordinary belts. And even better, it's not really any more expensive than any high quality belt. This is definitely a worthwhile investment that will pay off in bigger, stronger muscles.